Packed with clear, step-by-step recipes to let you protect you valuable data with your own chat servers, code hosting and collaboration tools. This book will help you develop the skills required to set up high performance and secure services with open source tools. Starting from user management and an in-depth look at networking, we then move on to cover the installation and management of web servers and database servers, as well as load balancing various services. You will quickly learn to set up your own cloud and minimize costs and efforts with application containers. Next, you will get to grips with setting up a secure real-time communication system. Finally, we&apos;ll explore source code hosting and various collaboration tools. 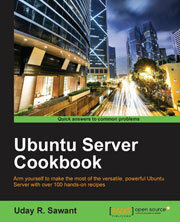 By the end of this book, you will be able to make the most of Ubuntu&apos;s advanced functionalities. This easy-to-follow guide contains a series of step-by-step recipes ranging from simple to complex. Each topic will start with basic introduction to each technology followed by a detailed step-by-step installation guide and then a detailed explanation of the approach taken during installation and the various advanced options available.